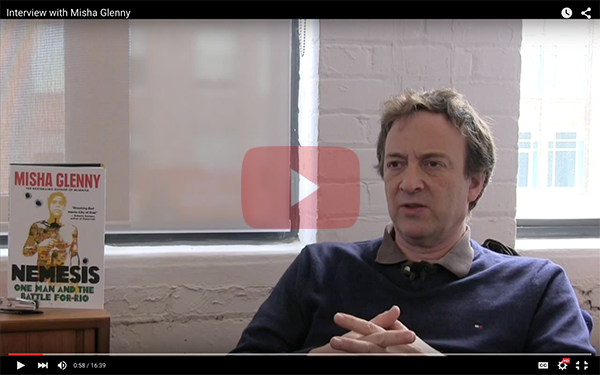 Watch journalist Misha Glenny discuss his new book Nemesis: One Man and the Battle for Rio, the complex nature of drug trade in Brazil, and the unique rule of one of its most powerful drug lords. From his time spent in a Rio slum researching the situation in Brazil, to spending time getting to know Nem and his family, Glenny’s insight into Rio’s multifaceted corruption is compelling and important. Nemesis is about a man called Nem; about Rocinha, the slum or “favela” he grew up in and came to run as a private fiefdom; about Rio, the beautiful but damned city that Rocinha exists in; and about the battle for Brazil. Nemesis pans in and out from the arc of Nem’s individual, astonishing trajectory to the wider story of the country that he exists in. It’s about drugs and gangs and violence and poverty. It’s about a man who made a terribly dangerous and life-altering decision for the best and most understandable of reasons. And it’s about the wider forces at work in a country that is in the world’s spotlight as never before and is set to stay there. Those forces include the evangelical church, bent police and straight police, drug lords, farmers, TV magnates, crusading politicians, and corrupt politicians. And what they are engaged in is nothing less than the battle for Brazil’s soul. Misha Glenny is the international bestselling author of McMafia, a finalist for the FT/Goldman Sachs Business Book Award; DarkMarket, a finalist for the Orwell Prize; The Rebirth of History; The Fall of Yugoslavia, which won the Overseas Press Club Award for Best Book on Foreign Affairs; and The Balkans. He is a regular contributor to newspapers and magazines such as the Guardian, the London Review of Books, the Globe and Mail, the New Statesman, the Washington Post, and the Financial Times. He lives in London, U.K.